Many years ago, in Green Bay, there was once a bar on Main Street. It was named Buddies. Buddies was then Some Other Place, which then was And Another Place, then Longshotz, and it’s now back to Buddies. The circle of life, my friends. Err, the circle of Green Bay, I should say. Buddies, back in the day, was a hotspot for the gay and lesbian crowd. And that stands true for today. My Gal Friday and I dropped in one Thursday evening. It was early, and fairly quiet. There were a few people hanging out around the bar. When we entered, I heard Backstreet Boys blastin’ from the radio, and instantly knew this is where I belonged. However, my girlfriend thought it was ‘Nsync. Sometimes, I don’t know why we’re friends. Anyway, the bartender was super friendly and greeted us immediately. Once we sat at the bar he strolled over, we told him our beverage order, and he quickly mixed away. 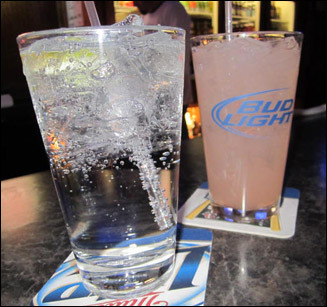 I ordered a vodka soda while my friend ordered a vodka grapefruit. Both were $4.50. If vodka isn’t your thing, then pick rum, tequila, whiskey, or any of the other million types of liquor they have. You’ll find something, I’m sure. As for beers, on tap Buddies serves Mich Ultra, Coors Light, Bud Light, and Leinie’s Honey. However, in bottles, they carry a much more wide variety. I saw bottles of Stella, Fat Tire, Rolling Rock, Corona, and other Bud, Miller Lite and Leinie’s products in their cooler. I noticed that there was a back door leading to an outside patio thingy, but it was closed. And I’m assuming for obvious weather reasons. My girlfriend and I chatted it up for a while, but if you’re not in the mood for chit chat, then play a game of darts, or play on one of the gambling arcade machines. You can watch TV or simply watch people. While we were there, only a few more people came in. I was told that the best nights are weekend nights.